The following is a log of a class in the Dramatica Theory of story held on the internet by Melanie Anne Phillips, co-creator of the Dramatica Theory of Story. Dramatica : If you have any topics about the theory or the software, I'm your gal! Dramatica : Hmmmm... thinking can be bad for your health! "The more they over-think the plumbing, the easier it is to stop up the drains!" Well, definitely a quiet night! Dramatica : Okay... What is your OC Act 2? Dramatica : Alright. Every "Act" in a four-act structure, is not really descriptive of an activity, but is a sign post on the path of that throughline. If your Act I for your Obstacle Character is Progress, then it means they are starting at Progress. In other words, when we come to them at the beginning of the story, Progress best describes the principal area of their efforts and concerns. For an Obstacle Character, we measure them most by their "Impact" as opposed to what they, themselves, are paying attention to. So, the Obstacle Character's impact concerns "Progress" in Act one. But that is just where they start. Their impact shifts from Progress to Future. That is really what the first act of the three-act structure is all about. The OC's impact "shifts" from Progress to Future over the course of the act. When the OC's impact is fully on the Future, that is where we feel an "act break" in the story. Now, an impact on Progress, simply means that the OC is having an effect on Progress, everywhere they have an influence. They might be speeding up Progress, or slowing it down. Whichever way the impact, depends upon what is needed to ultimately bring the Main Character to consider changing their approach. By impacting Progress, the Obstacle Character forces the Main Character into a position where they must abandon their approach in one area, and therefore, by the end of the act, the Main Character has "grown" a little closer to addressing the central issue of the story... the Obstacle Character has forced them to grow a bit, in order to avoid having to deal with that issue right here and now. But as soon as the Main Character thinks they can relax, the act changes, and the OC's influence can be felt in a new area; Future. Future is just the thing that will force the main Character forward in their growth to that ultimate decision to remain steadfast or change. And, Future will be able to do that without allowing the MC to back slide to where they started. It is important to keep in mind, that the OC may not even be aware of their impact on the MC. They might, of course, but they don't have to be. StephenHR : My OC is also my Protagonist, and I was not considering his different effect in those roles. Dramatica : Yes, it's hard to keep from thinking of the Protagonist as the MC, even if they are the OC. Because they are so important to the logistics of the story as a Protagonist, we have a tendency to want to know what they are thinking and feeling. And there is nothing wrong with that, especially when they ARE the MC. But when they are the Obstacle Character, we won't be standing in the Protagonist's shoes. We, as audience, will be standing in the shoes of whoever the Main Character is, and we will be watching the OC as Protagonist, and evaluating what impact they are having on us, the audience (Main Character). Of course, the Main Character view for the audience is the "first person" experience, where the experience feels like "I" or "me" to the audience, as if they are living the story themselves. From this perspective we, the audience, see the Obstacle Character as "you". We watch what they are doing, and judge what it means to us. Then, the relationship between "I", the Main Character, and "you" the Obstacle, is the Subjective story, "we". StephenHR : Maybe I have a problem (again) with my Storyform. The story is titled, "The Dreams of the Assassin". The killer is the OC who forces the MC, a psychologist who tries to help him with his bad dreams and is forced to face his own "skeletons." The problem with the killer as the OC is that we spend a lot of time in the killer's head. Dramatica : That is a very touchy storytelling problem. StephenHR : His internal journey forces his external journey which forces the MC to make his own leap. Dramatica : If you look at "Philadelphia", which I haven't seen, but Chris uses as an example, the MC is the change character. He talks of the scene where Tom Hanks is listening to the music. Dramatica : Chris says that scene is shot in first person, but that the role of MC was muddied in the film, and as a result, it seemed very interesting, but somewhat odd, to be in his head at that moment. This seems something akin to the situation, in general, in your story as described. It is really a matter of perspective. You know that feeling you get as an audience when you are watching something happen to someone, and you feel as if it's happening to you, versus the other kind of perspective where you see the same thing happening to someone, but you feel like you are watching it happen to them. Dramatica : Look to the "Freddy" horror films... You'll see that in some of the films, several people get sucked into the dream world, but only one of them has us feeling that it is happening to us. When you are dealing with the Obstacle Character, we will care more ABOUT them than any other except the Main Character, but we will not feel as if what happens to them happens to us. So, you need to keep your perspective somewhat "detached" from the OC, even when they are experiencing very personal things. The more personal you make their adventures, the more difficult the task of keeping the audience from identifying with them, instead of just sympathizing for them. So, you have constructed a very interesting storyline, but you will need to be very careful in how you present that character, to keep from muddling your throughlines. Did you see "Lawnmower Man"? Dramatica : Did you notice how the Lawnmower Man himself was not the Main Character? And this was true even though he had so much screen time. We never felt like we were this guy. Rather, even though we felt he got a bum shake, and was taken advantage of, during most of the story he is a very sympathetic character. Yet, we never identify with him. It is the rather obnoxious doctor we identify with. That is part of what made me not enjoy the viewing experience. I didn't want to be the obnoxious doctor, I really wanted to be the Lawnmower Man. That would've been wonderful! StephenHR : I found that film distant. too. Dramatica : Then we could all engage in a tirade against the establishment, and feel somewhat justified, and even if it ended in tragedy, we would have gone down swinging, but instead, we end up winning, and feel like we lost! Still, they were very consistent in how they presented the Lawnmower Man, so they did a good job of storytelling, even though I think they made a poor choice from an audience reception stand point. StephenHR : Well, this is the issue. I'm afraid to ask "you" to be the killer. Dramatica : Why not ask us to be the killer? Look at "Natural Born Killers", Look at "Pulp Fiction" Look at "Naked Lunch". All of these have rather despicable characters as Main Characters, and we get into it being able to be bad without having to pay the price in the real world. StephenHR : It's weird. I feel guilty? This is about paying the price. Dramatica : Sure, guilt can be a good reason. You have to write what works for you, but one reason a lot of writers are motivated to write, is to confront their own fears and prejudices, and work them out through the creative catharsis of storytelling. StephenHR : Yeh, too true. Dramatica : Holding back seldom made a revolutionary talent. But it can keep one employed in the machine as a staff writer. Dramatica : As a staff writer, the LAST think you want is being revolutionary or cathartic. StephenHR : OK, I'm going back into the Storyform. I'm not staff. Dramatica : Good for you! Take some chances, and if they don't work out, don't show them to anybody. Safest thing in the world. StephenHR : I was really let down by Lawnmower Man. Dramatica : Me too. I thought it was a major cop-out. Hiya, IAM! Dramatica : Welcome to the Dramatica Chat! IAMWEALTHY : Hi, sorry to get here so late. Dramatica : No problem, I'm here every Friday night from 9 - 10 PM Eastern. Do you have any questions about the software or the theory? IAMWEALTHY : Can I ask if there will be another storyform? Dramatica : What version of the program do you have, and MAC or Windows? Dramatica : Oh, the newsletter! Yes, we are working on one right now. This will be issue #5. Dramatica : We have had to limit our schedule to 3 or 4 issues a year, as we are all busy creating new things to go in the software, and have to take time from that to write the articles for the newsletter, but it WILL continue! In this upcoming issue, I hope to have an article on The Vampire Chronicles, and on The X Files, and a few other items we are working out right now. Examples from real stories or just like the scenarios we have in our Context help in the program. Dramatica : No. Well, as you know, there are three or four dramatic illustrations for every storypoint in the software. You just click on the item you want illustrated and then select the "context" button in the Dramatica query System. There are about 2200 contexts, each with three or four examples! It took a team of six Dramatica Interns six months to write them all! IAMWEALTHY : I'll try it. Thanks. Dramatica : As for real story examples, we ship about 20 stories with the software right now, and more are on the way, including Being There, and A Doll's House. We post new ones all the time on your Dramatica BBS. You can download them at no charge. IAMWEALTHY : I'm dealing with the Thriller genre. Dramatica : Are you connected to the Dramatica BBS? Dramatica : Good. We just got a couple of notes from horror/thriller writers who asked about more storyforms in their genre. So, we have determined to do some Stephen King and Dean Koontz. As for thrillers, perhaps we should add Robin Cook or ? Do you have some films or authors you'd like to see done particularly? IAMWEALTHY : None I can think over at the moment. Dramatica : Well if some come to mind, post them on the Dramatica BBS, and we'll give them priority. 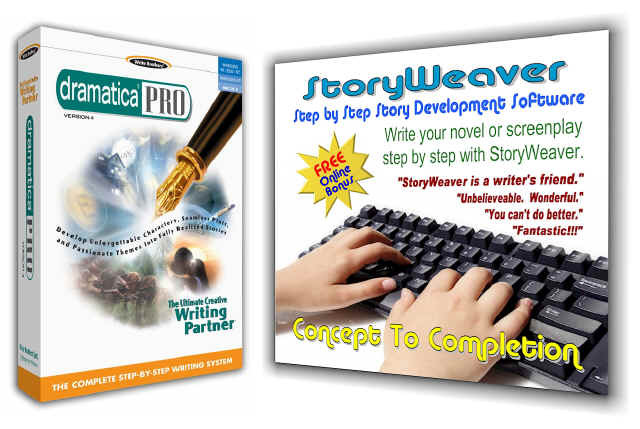 Dramatica : We also just added a "Writer 2 Writer" conference on the BBS. So now you can post messages to ask questions or share information with other users. And, of course, we have the "User Storyforms" folder, where you can upload your own storyforms of well-known stories and see what other say. IAMWEALTHY : Would it be alright to ask question that just pertain to my story? Dramatica : Sure, ask away! IAMWEALTHY : I'll be prepared in the future, this is new to me. Dramatica : Its new to most everybody. Chris and I have worked on it for 15 years, but the software has only been out 9 months. And already we're in Wired and on CNN! Fast stuff! StephenHR : Great chat. I think that this next dive into my Storyform will be fun. Thanks. Dramatica : Okay, Stephen, good night! And thanks for joining us! Dramatica : Okay, so what's your question, IAM? IAMWEALTHY : No question today. Dramatica : Same Dramatica time, Same Dramatica Channel!